Hello everyone! I’m back again with my annual ONE home decor sewing project for the year! When I moved into this place last year, one of the biggest perks was the amazing porch that takes up an entire side of the house! 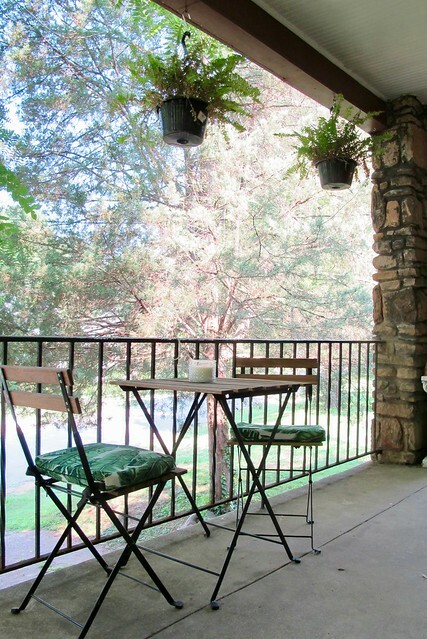 Situated in the perfect spot to catch a good cross-breeze, and shaded by several walnut trees at the peak of summer, it is a seriously cool area (both literally and figuratively) to hang out in. I love sitting out here, whatever the reason – while working in in the morning, while having cocktails with friends, I even use this space to clip my cat’s nails (she loves it haha). 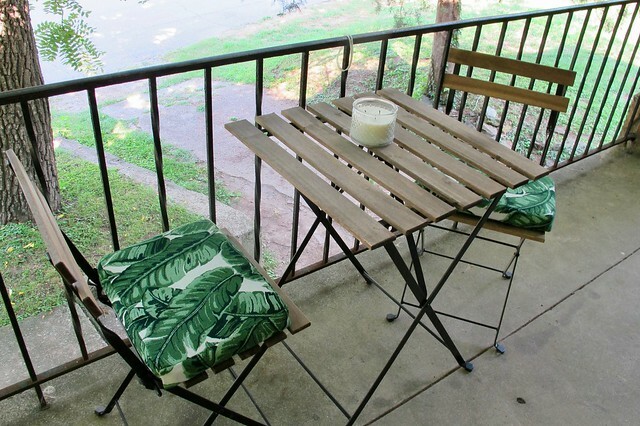 I brought this patio set (originally from IKEA) with me when I moved here, and have been wanting to add chair cushions to make them a little more comfortable. Since the seats are very small, I couldn’t find any cushions that fit – plus, outdoor cushions are expensive! 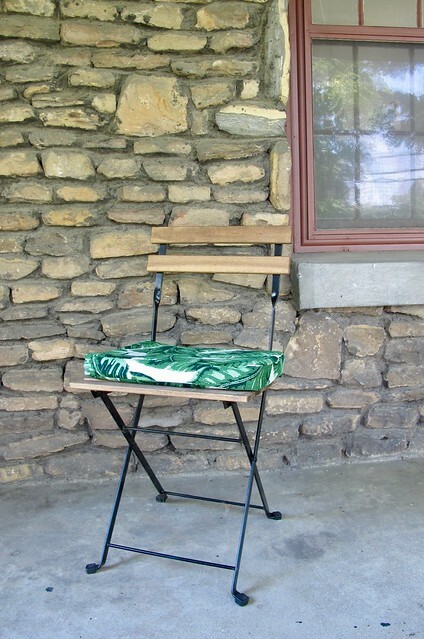 I figured I’d make my own, which set me on a looong quest to find that perfect outdoor cushion fabric. 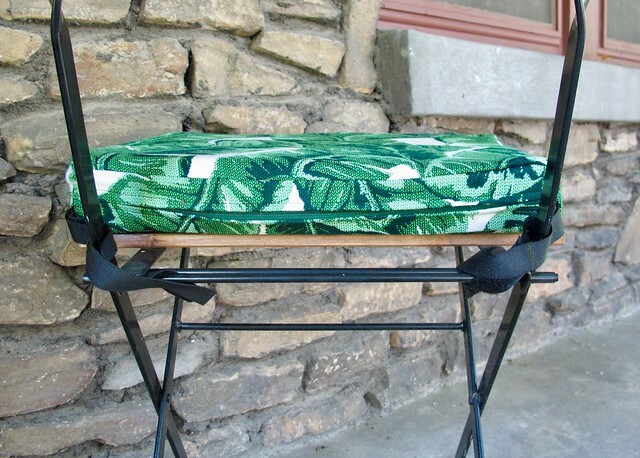 That fabric ended up being this Sunbrella Fusion Tropics Jungle Leafy Jacquard from Mood Fabrics. 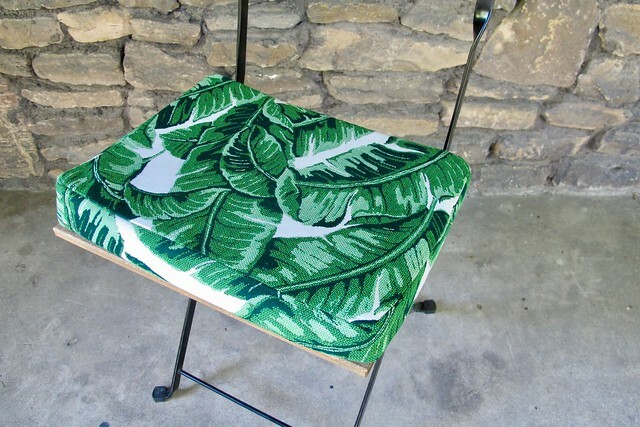 I’m loving this botanical vibe that’s currently taking over home design, and this fabric is one of the best ones I’ve seen! Since it’s an outdoor-suitable home decor fabric, I knew it would stand up to the sun, wind, and rain. 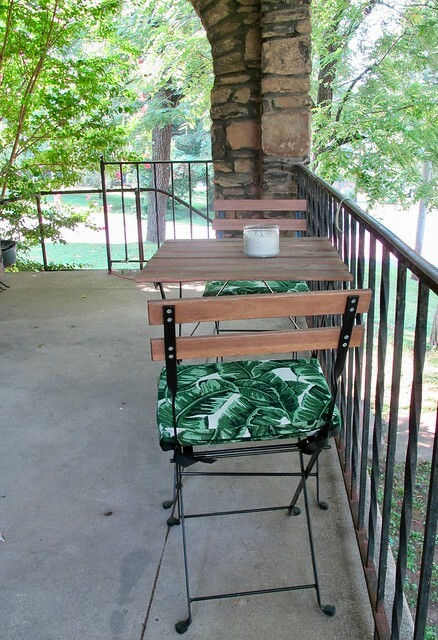 At $42 a yard, this fabric certainly isn’t cheap – but it’s wide, so even a yard goes a long way. I bought some inexpensive upholstery foam and used the seat measurements to make a very basic pattern. I wanted a cushion cover that would box around the entire block of foam, with a zipper at the back so I could remove it to wash if needed. The foam I used is quite thin, so I doubled it for a cushier chair pad. The metal zippers were pulled fro my stash. I debated on whether or not to pre-wash the fabric before sewing – ultimately, I decided against it. The fabric is polyester, so I don’t think it runs the risk of shrinking. That being said, it does fray like CRAZY (seriously, my studio was covered with little green hairs after this project), so I serged every single seam before attaching pieces together. I don’t sew a lot of home decor projects, so I want the ones I do manage to make to last! To attach the cushions to the chairs (mainly so they don’t fly off during a windy day! ), I added long velcro strips that wrap around the metal parts of the chair. In retrospect, I’m not crazy about how this looks – I may take those out and replace them with self-fabric ties. But they are functional for now. And that’s pretty much it for this project! 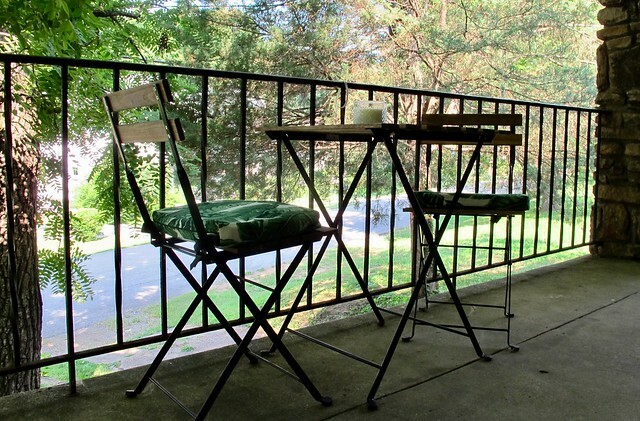 Short and sweet, pretty simple, but a nice touch to my outdoor space! I actually finished these a couple of months ago and they have been living on my porch since then – through Tennessee summer storms and crazy sunshine (although my porch is pretty shaded, so not *that* much sunshine), and you can see how well the fabric has held up! The colors are still nice and bright, and the cushions have avoided stains. I will bring these inside when winter comes, of course, but they are great for staying out all summer long. Classic Navy and White for Spring!